Is Discord The Free Slack Alternative for Your Growing Team? Almost everyone who communicates with people online have heard of Slack. It’s communication software designed to replace email and make team communication a cinch. In a lot of ways, Slack is the industry standard for this kind of app. But it’s not the only player in the game. Discord team chat is nipping at its heels, and as a completely free alternative, puts up quite a fight. When you first boot up Discord, you will notice one major difference between it and Slack. Slack is business software that is wholly designed to be a workspace first and foremost. Discord, on the other hand, is primarily a communications tool aimed at gamer communities. But don’t let that dissuade you. Discord team chat is fully featured and does just about everything that a growing team needs, without the cost that comes with Slack for a few of the more important features. Regardless of which software you choose, there are a few major features that make them worth using. The major benefit of these kinds of apps comes in connecting remote teams (and local ones, too) in a way that email and traditional IMs just can’t. In general, the big draw is that you can have separate channels for any number of topics or teams in your organization. For instance, we have a #content channel here at ET in Slack, while there is also a #development and #support and so on. You can also have private channels for smaller groups or topics, like if you go to a conference or have a special project (#wcus2017 or #blackfridaysale, maybe). And you have private messaging between users, either one-to-one or group messages. You can do anything within a private message you can in a normal channel, only the contents stay between you and the other members of the chat. For the most part, Discord and Slack both function identically with this. You get @ mentions and all the standard stuff you’d expect out of communication software with Discord team chat and Slack both. In addition to private messaging, you can have calls between members of the server. These are VOIP calls like Skype, and they can be audio or video. With real-time interaction the main focus of Discord, the calls and video chats work pretty seamlessly. In my experience, they have higher quality for both audio and video than Skype, Slack, or Google Hangouts. One check in Discord’s favor her is that instead of having to set up calls, you can just make voice channels. These are channels that still have text chat, but also have an open audio feed where folks can talk and communicate in real time. They can be private or public, and any number of people can be a part of it. Mobile apps for team chats are necessities. What ends up happening is the chat channels turn into what might as well be text threads (with push notifications to boot), and you can initiate audio calls that come through like phone calls and video chats are essentially Facetime sessions. I’ve personally used both apps on a regular basis for all of the main functions, and neither Slack nor Discord’s app is really better than the other — they both do exactly what they’re supposed to. You don’t have to pay for Discord team chat. Ever. The paid Nitro service is full of generally cosmetic upgrades (animated avatars, custom emoji); however, there are some upgrades potentially worth it for your team: increased upload limit and HD screen sharing. Since the upgrade is on an account-by-account basis instead of server, the folks who need it can pay as they go. Also, Slack makes you pay per user, and Discord does not. You can have as many people on your servers as you want for free. Additionally, those users can sign themselves up without getting a special invite (which is not always possible for Slack servers). With Slack, you get to keep the most recent 10k messages your team has sent. Once you hit that limit, you cannot search the archives unless you pay. With Discord, you can just keep scrolling and searching. They even give you a handy-dandy before/after tag that you can use while searching to bring up a pop-up calendar widget to hone in. It’s good stuff. When enabled, you get “to have a high tech robot speak your notifications to you.” It works surprisingly well, and when you get a lot of messages in a channel or a conversation you’re watching, having it read in real-time makes it a lot easier to get work done simultaneously. I say crazy here in the best way possible. 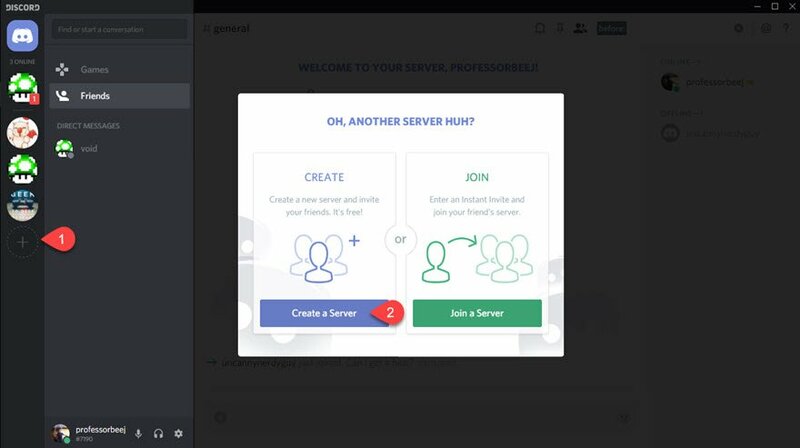 With Discord, you can invite anyone anywhere anytime to your server. You can also generate any number of links to do this. 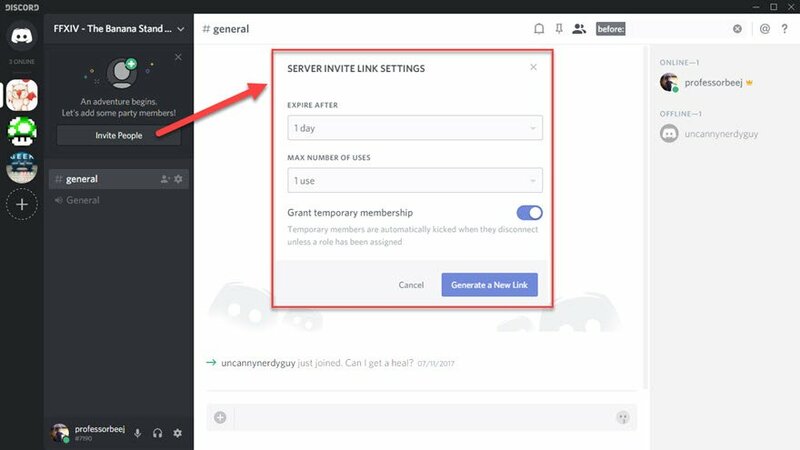 If you want an open-invite server, you can make a link that allows any number of users to sign up and the link will never expire. You can also set a limit on how many uses the link can have, expiration date, and even grant temporary membership so that the account they create is trashed when they disconnect. That way you don’t have people who need a single tech support conversation (or phone interview, etc.) hanging around your server when they don’t belong there. Additionally, you can create as many servers as you want, just by clicking the + symbol in the left sidebar. So if you want a server for just guests that is totally separate from your primary team’s server (even outside of private channels, etc. ), you can do it with a couple of clicks — for free. When it comes to connections and utility, Slack’s developer API wins hands down. You can do so much with dev integrations in Slack that it’s hard for any software to compete, really. From Google Drive to Trello to Giphy, whatever you need to link to Slack, you can. With Discord, there is automation and a developer API, but the bots are generally for entertainment purposes. You could write some of your own, though. Discord is aimed at gamers. You might honestly be put off by that. Slack presents a polished, business-oriented theme, while Discord is laid-back and casual. The features are documented with gamer communities and streaming in mind, while Slack’s are productivity-based. For some teams, this might not be a big deal — the branding isn’t actually in the way of the product features. However, some teams may not be comfortable with having that as the main aesthetic of their business communications (especially if you bring clients online), so if that’s the case Slack is definitely the winner in this case. Additionally, because of it being deemed as gaming software, some corporate firewalls may block Discord. You’d have to get special permissions and exclusions set up. For smaller teams and companies this might not be an issue, but it is an extra hoop to jump through if you’re in a larger, corporate setting. With Slack, you have a separate user account for each server you’re on. So if you have a hobby slack and a work slack, you can have two separate profiles (even with the same email address). With Discord, you have a single username (ex: DiviUser#1337) that carries over for all your Discord servers and channels. This allows you to have a friends list (or contact list if you’re using it professionally), but it also makes your two worlds collide if you use Discord for hobby servers, too. In Slack, you get 1 gb file sharing of any type. In Discord, you get 8 mb. If you pay for the Nitro plan, you get 50 mb. That’s a big difference. Additionally, Discord files are limited to audio and video, while Slack lets you make posts, send and share PDFs, etc. That’s because Slack is a workspace, while Discord is a communications tool. Verdict: Is Discord Team Chat a Viable Slack Alternative? Slack, on the other hand, is a more complete workspace. The file sharing is much better, and the ability to keep your work and play separate is a must-have for a lot of people. Also, if you’re big into automation, Slack’s apps and Slackbot are way better than the Discord versions. However, the freemium model may not work for all businesses, and paying for access to everything on your server after you’ve grown your team with a certain budget can be pretty disheartening. If communication is your main focus, Discord is robust and easy to use. While Slack has a few more bells and whistles, they may not be worth the cost in the long run for your team. Do some tests and try them out for yourself since they’re both free to start with, but I think you’ll find that Discord is a lot more than just a tool for gamers to organize play sessions. Have you tried Discord for your team? Let us know how it went for you! Trello can be one as well. A few fixes, since I use Discord regularly. – Currently, you can join maximum 100 Discord servers per account. – You can set your own nickname per server so it displays your nickname rather than username (separated from your username that has discrim (#)). You’re absolutely right. Thanks for the fix. One thing about changing your nickname per server is that it’s user-role dependent, so your admins have to allow it. I use Slack for my day job(provided by my employer), and as a freelancer, I use Discord to connect with my clients. Discord is fine, no issues so far. That’s true, but a primary benefit for Discord is being able to keep up with multiple servers at once, just like you can be logged into multiple Slacks at once. Having a separate Discord account for work is functional, yeah, but I think it’s a con because it removes you from the others, while with Slack you can have multiple accounts, no matter what kind, in the same app. On a personal note, when I migrated from using Skype to Discord, I experienced such a drastic improvement in quality. Better calls, more stable interface, less resource intensive, everything. It nails everything over Skype, in my opinion. I haven’t looked back since. I hate using Skype, personally. One of the only reasons I would do so anymore is to use the Ecamm Skype Recorder for interviews, etc. It’s a fantastic piece of software. I missing the information if its possible to integrate it somehow with wordpress? You can integrate it using botsand various Webooks for different WP-related things, and there’s an embed for each server that can be inserted into WordPress. There are also a few plugins out there that let you automate invites from WooCommerce and similar things. Thank you B.J. Keeton for share us. Do you know GLIP.com? I prefer use this than Slack. They starts with $0, with unlimited posts, unlimited storage, unlimited integrations, unlimited guest users, 500 min. of shared video chat. Please check if you can make in a future review about this great tool. I don’t know it, but I will totally check it out. Thanks! Microsoft Teams is now for free, too. I had no idea! Last I checked in with MS, their team and CRM stuff was all cost prohibitive for many people, so it’ll be interesting to see how this one goes. Thanks, Peter!